The new MCSA: Windows Server 2016 certification can be earned by taking and passing the three exams listed below. 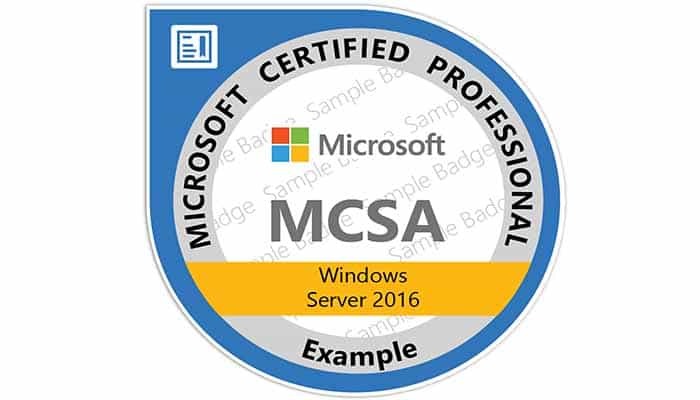 Individuals who currently hold either an MCSA: Windows Server 2012 or MCSA: Windows Server 2008 certification will be able to upgrade to the new 2016 certification through a single, upgrade exam Exam 70-743: Upgrading Your Skills to MCSA: Windows.To prepare for this exam we offer the course 20743 – Upgrading Your Skills to MCSA: Windows Server 2016 – Official Microsoft Course. To get the MCSA: Windows Server 2016 you need to pass the exams: Exam 70-740: Installation, Storage, and Compute with Windows Server 2016, Exam 70-741: Networking with Windows Server 2016, Exam 70-742: Identity with Windows Server 2016 in any order. To prepare for these exams, we offer the official courses below, which you can attend in any order.